This week, an original essay from Naomi Racz. 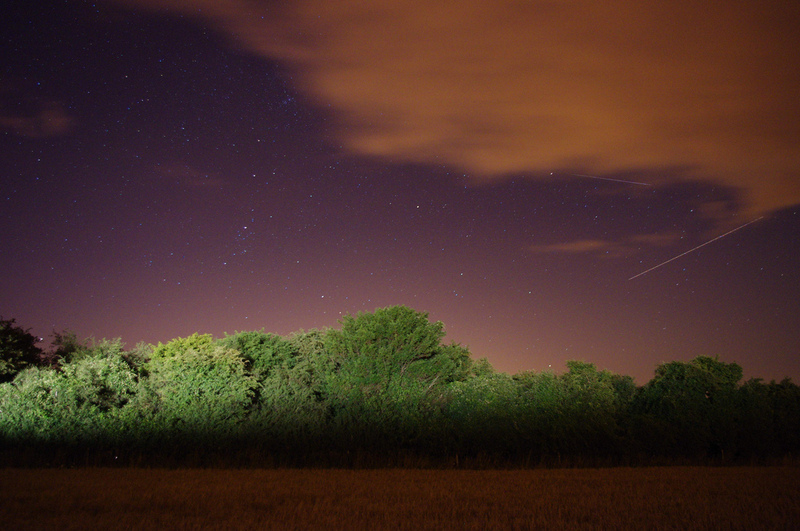 Image ‘Perseid at Butser Hill by Peter Griffin via Flickr. Despite the fact that it is the middle of August, I dig out my winter coat from the closet. In its midst, summer seemed like a fixed state. It was hard to imagine that there would ever be anything but heat and light. That there would ever be anything but birds flitting between the hedges and lazy afternoons at the park. But now, the season is slowly undoing itself. There is a chill in the air and the light has taken on a watery, washed-out quality. In a few weeks, summer will seem unfathomable. long ago they remember walking very slowly to the window. and stood in their old clothes, growing frost at the edges. Our neighbourhood slopes up towards a golf course with a bridleway running through it. We decide to head in that direction, hoping to find a pool of darkness from which to see the Perseids. Just one shooting star will do, I just want to see one. Not the kind of seeing where it catches the edge of your vision and you look just in time to see a memory of it on your retina. I once saw a meteor in that half-glimpsed way, as a child. We were on holiday in Devon, staying at a hilly camp site overlooking the sea. One evening we were down in the small, breeze block building that served as a kitchen. I needed to fetch something from the tent and ran up the hill as fast as possible. Reaching the top, I threw myself down into the long grass, imprinting my body on the Earth with broken stems. Below me I could see the dark mass of the sea and the silhouettes in the kitchen. Above me, stars. Not the occasional star, like I sometimes saw in our back garden in Manchester, but uncountable stars. And then I saw it – or half saw it – the shot of light. I made a wish, just in case. I wished for a new pencil case. No half-stars for me tonight. Tonight I am determined to see a meteor at the exact moment its light reaches Earth. But first, we have to find darkness and it won’t be easy – there are street lamps every few metres. When I cup my hands round my eyes to shade them from the lamp light, I realise that there is still the faintest tinge of setting sun to the sky, turning it violet near the horizon. I take my hands away and the sky turns a deep, bruised purple again. Beyond each street lamp there is an illusion of darkness, but each time we approach the dark, there is only more orange glow. Our eyes are being fooled into seeing something that isn’t really there. We reach the golf course, but it still isn’t dark enough. Even walking down the bridleway doesn’t bring us much luck – there is a bright white street lamp half way along the path. Usually I would be grateful for such a bright light. Darkness isn’t something I tend to seek out in this city. Eventually, we settle on a nook in the path with enough trees to block out most of the light. We stand side by side, heads back, and wait. only their eyes increasing into tiny stars. Far away, faint stars become visible amongst the brighter ones. An even brighter light appears and wriggles across the sky before disappearing again – a satellite on a drunken orbit. A plane flies by at the edge of my vision and I quickly turn my head, thinking it is a meteor. I turn my head every time the trees rustle too. The act of standing with my head back, looking out across a distance my eyes cannot understand, is hypnotic. I feel as though my body is starting to sway and that if I stand here long enough, I will drift off to sleep and fall right off the Earth. Drowsily, I imagine future children on distant planets waving down at me, the way we would wave at lorry drivers on school coach trips. Perseids. Perseids. The word evokes things ancient and heroic. I say it over and over in my head. Perseids. Perseids. Perseids. Alice Oswald’s poem is based on the Greek myth of Tithonus, a mortal man who is made immortal by Zeus, at the request of Eos, the goddess of the dawn. But Eos forgets to ask that he not age and so despite his immortality, Tithonus grows old, eventually ending his life as a grasshopper. The universe too, is a kind of Tithonus, immortally ageing. After a while my neck starts to hurt and we’ve still not seen anything, so we decide to slowly make our way home, still clinging to the hope of seeing a meteor. At the edge of the bridleway we stop to take in the view. There had never been so much beauty. burned a way out through a nearby horizon. Before us, the rooftops stretch out towards the lights of the city – small meteors collected in the bowl of the land. Wish upon a sodium lamp. We head down the hill, stopping every now and then to cup our hands round our eyes and check for shooting stars. Walk. Check. Still no luck. Carry on walking. Stop. Check. There! But I only catch it out of the corner of my eye. We’re just rounding the corner from our house when I finally see it – a meteor shooting, falling, Perseiding across the sky. I made a wish. I’ll tell you what it is, if it ever comes true. Posted in Stories and tagged astronomy, CNF, creative non-fiction, non-fiction, nonfiction, Original Nonfiction, short stories, stars. Bookmark the permalink.